Phipps Conservatory’s breathtaking Winter Light Garden is so bright that it’s hard to miss if you are in Oakland after dark. Catch it until January 8, 2017. 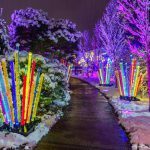 To achieve the Winter Light Garden, the Phipps team worked with us, Hanlon Electric, to design a robust power management plan and install many of the structures. Phipps met with our journeymen on a weekly basis during installation to review designs and assess installation progress. Only through collaborations with artists, fabricators and electricians was the vision for Winter Light Garden actually achieved. Click here for more details or to visit Phipps Conservatory’s Website.